When we engage in negative self talk we are sabotaging ourselves from living our “best life”. In other words, when we are laying self blame over an incident, finding fault in our appearance, or seeing ourselves as lacking in some way, we are in self sabotage mode. Negative self talk can be destructive, and it can keep you from reaching your goals and dreams. Therefore, you have to feel that you deserve what you accomplish. Otherwise you simply manifest what you feel you deserve. If it’s nothing you will get nothing. Thus, a good personal affirmation mantra can be very helpful to you. It will help you shift your thoughts towards more positive outcomes. I am fat. Cancel and delete. I am beautiful just the way I am! I am unlikable. Cancel and delete. I am loved and accepted just the way I am everywhere I go. I never fit in with others. Cancel and delete. I am accepted just as I am. I will never reach my goals. Cancel and delete. I will now reach every goal I have set for myself. I will never meet my soul mate. Cancel and delete. I now choose to meet my soulmate. Keep it short and simple so that you can memorize it and use it whenever you catch yourself in negative self talk. Visualize the strike through, cancel and delete, and then use your affirmation mantra to override it. Make sure that you re-evaluate this every once in a while and adjust your mantra to the current situation you are in. You will find that it is not easy to catch ALL the negative self talk but with diligence and practice you will soon transform the way that you think about yourself and the world around you. 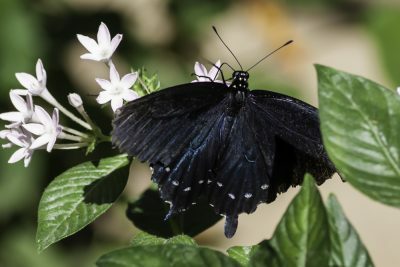 I chose a swallowtail butterfly for today’s photograph because this insect is all about transformation. In fact, your thoughts are the key to making all the changes that you desire in your life and the butterfly’s energy can help you. This site is my newfound goldmine!